Beth Corning in CorningWork’s The Glue Factory Project: “Beckett & Beyond.” Photo by Foo Connor. Dancer/choreographer Beth Corning has been a unique voice on the Pittsburgh dance scene since arriving in 2003 to take over the reins at the now defunct Dance Alloy. It has been with her 5-year-old umbrella organization CorningWorks however, that she has upped the ante on the level of dance-theater work she is producing. Work that is more often than not entertaining, detailed, cerebrally challenging and powerfully moving. With her latest Glue Factory Project (projects featuring performers over age 45) work Beckett & Beyond, Corning and crew offered up perhaps her most theatrical work yet. 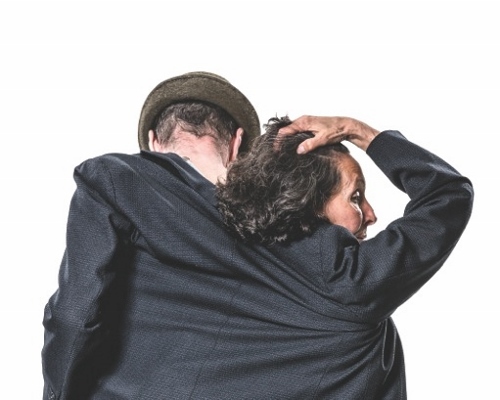 The 70-minute Beckett & Beyond, set to music by MaryEllen Childs, Kronos Quartet and Meredith Monk, was bookended by two short physical-theater pieces by Nobel Prize-winning playwright Samuel Beckett. On a set designed and constructed by Stephanie Mayer-Staley featuring a white dance floor raised at the back end that led into a white back drop with papier-mâché clouds suspended above, the production had the look and feel of a work one might see on stages in Stockholm or Berlin rather than at North Side’s New Hazlett Theater. It began with Beckett’s “Act Without Words II.” In it, a pile of clothes and two large bags were left onstage from which veteran performer Francoise Fournier emerged from inside one after some prodding from a long pole that humorously inched out from a side wing to poke the bag she was in. Fournier’s character was a pill-popping woman soured by the seeming drudgery of her everyday life. She muddled through getting dressed in an oversized mens suit, had a distaste for vegetables and struggled with the metaphoric chores of life, represented by her unsuccessfully trying to drag hers and the other bag across the stage. Former Cullberg Ballet dancer Yvan Auzely, who then emerged from the other bag after more prodding, was Fournier’s opposite, an archetypical “morning person” who approached the same tasks as Fournier’s character but with energetic vigor. The pair’s performances in Beckett’s bleak and simple commentary on human existence were meticulous and captivating. The Corning choreographed middle section of Beckett & Beyond that followed felt as if it, and the Beckett works, had always been linked. The work’s thematic questions on existence and humanity’s place in it were a potent heart and mind stimulant. At once provoking the viewer to see the cyclical and often futile nature of life, then spurring them to ponder their own existence. 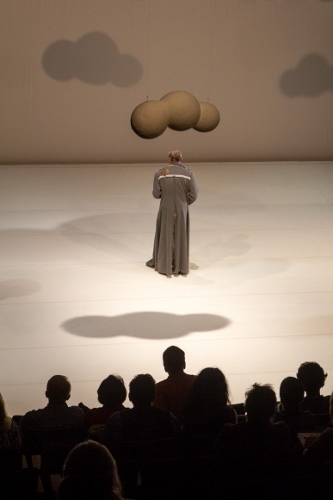 Yvan Auzely in CorningWork’s The Glue Factory Project: “Beckett & Beyond.” Photo by Foo Connor. It began with Corning, tethered by a thin red bungee cord, walking as if teetering on a high-wire, keenly aware of her balance. The red bungee cord a metaphoric reference to an East Asian legend/belief that we are all connected by an invisible red thread to those we are destined to meet in our lives. In Corning’s case that thread was suddenly severed, as the cord that ran from her into a side wing snapped, pelting her with its recoil. The red thread theme continued with Auzely in a solo in which he weaved a spider web out of the red bungee cord across the stage, and then with Fournier in a solo, looking pregnant and acting mentally unstable. A highlight of the work, Fournier’s bundle of joy turned out to be a bundle of clothes stuffed under her shirt that she treated as cherished memories. Muttering in French, she wandered about the stage pulling children’s outfits and others out from her shirt and then with a laugh, sigh or tear, pinned them to the red bungee cord as if it was a clothesline. Each brief, emotional moment conjured up a universally relatable story about her character’s past life. Fournier is a marvelous dancer/actress and she shone in the solo. The work continued with the trio of dancers performing perhaps the most physical dance choreography I have seen in a Glue Factory Project production to date. The 50-plus-year-old dancers hurled themselves onto one another and trotted around the stage without strain. Perhaps intentionally or unintentionally Corning’s choreography at times was reminiscent of the late Pina Bausch’s work. The dancers as a trio, arms about each other’s waists and running in a circle, along with scenes of rapid emotional changes in expression, were Bausch-esque. Similarities aside, the work had Corning’s choreographic style imprinted all over it. Yvan Auzely and Francoise Fournier in CorningWork’s The Glue Factory Project: “Beckett & Beyond.” Photo by Hakan Larsson. Beckett & Beyond reached its climax with the second of Beckett’s physical-theater works, “Rockaby.” Performed impeccably by Corning, the repetitive solo, directed by Pittsburgh’s Melissa Grande, was perhaps the most challenging for audience member’s attention spans but was also the most beautiful and poignant section of Beckett & Beyond. Like a narrative version of Ravel’s “Bolero,” Corning, in a dimly lit rocking chair, rocked back and forth as if on autopilot while a voiceover of her reciting Beckett’s dialogue for the piece repeated. With each go round, another phrase was added telling the story of an elderly woman who, locked in her own mind, spent her remaining days rocking in her chair and staring out a window. Corning was at her very best in “Rockaby,” her emotionally nuanced facial expressions and yearning utterances of the word “more” were soul-piercing. Was she calling for more of the story to be revealed; hers or the universe’s? Or did she just not want her life to end? The production concluded with twenty-something guest artists Anna Thompson and Taylor Knight (a.k.a. slowdanger) reprising Beckett’s “Act Without Words II,” further driving home the idea that life’s treadmill was never ending, generation after generation. Beckett & Beyond is a complete work from top to bottom and worthy of repeated viewings to soak in everything it has to offer and for the simple fact it’s pretty great. To CorningWorks I say: more please.